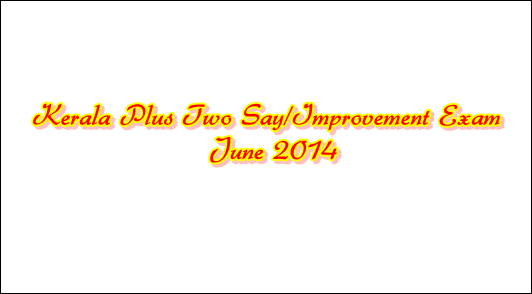 Kerala Plus Two Say/Improvement examination will be held in June 2014. As per the notification of the Kerala Higher Secondary Examination Board, the Higher Secondary SAY and Improvement Examination 2014 will commence from 03.06.2014. With a pass percentage of 79.39, a total of 2.78 lakh students have become eligible for higher studies. Read more to know about the procedure, important dates and other key points to remember. The Kerala Plus Two results 2014 was announced a week ago with a total of 2.78 lakh students becoming eligible for higher studies. A pass percentage of 79.39 were recorded in 2014. As per the notification of the Kerala Higher Secondary Examination Board, the Higher Secondary SAY and Improvement Examination 2014 will commence from 03.06.2014. The SAY Examination is being conducted for those regular candidates who had registered for the Second Year Higher Secondary Examination March 2014, but failed to become eligible for higher studies. Such candidates can register for those subjects in which they failed to attain D+ or above grade. The prime motive is to facilitate the person to improve in his/her grade in those subjects. For the compartmental candidates who have secured D+ or above for five subjects and appeared in the Second Year Higher Secondary examination March 2014 can register for the one subject for which he/she failed to accomplish D+ or above grade. It is very important to remember some key points which would enable each student to understand about the exam process. Candidates who are appearing for SAY/Improvement examination in Biology should attend both Botany and Zoology papers. Those who have not registered for the Higher Secondary Examination March 2014 are not qualified to register for the SAY/Improvement Examination June 2014. It is very important to note that, a candidate cannot appear for the SAY and Improvement examination at the same time. The higher secondary department will issue the consolidated certificate which shows the scores obtained at the SAY Examination along with that of previous exams as they become eligible for higher studies at the SAY/Improvement Examination to be conducted in June 2014. The certificate showing scores obtained at the Improvement Examination will be issued separately. The Principals of the respective school should have to register the candidates at their centre for SAY/Improvement Examination June 2014 through the online system which is available at the Department portal, dhsekerala.gov.in. The admission tickets can be downloaded from the website and should be distributed at least three days before the commencement of the Examination. Practical Examination will be conducted from 28.05.2014 to 29.05.2014 in selected centres, one in each district. The candidates from the Gulf Countries have to submit their application in the centres where they had registered for the Second Year Higher Secondary Examination March 2014. They can appear for the Examination at any one of the selected Examination Centres in Kerala. Meanwhile the candidates in Lakshadweep can appear for the Examination in centres provided in Lakshadweep where they had attended the exam in March 2014. Students who are appearing for the Kerala Plus Two Say/Improvement examination June 2013 should have a regular touch with the official website education department. The list of Higher Secondary Schools selected as Examination centres along with the list of Higher Secondary Schools clubbed to each Examination centre will be accessible through the department portal www.dhse.kerala.gov.in. Kerala SSLC results 2014 publishing date has been announced. The Kerala SSLC 2014 results will be announced on by the Education Minister Shri P K Abdu Rabb on 16th April at 3 pm. As the education department has completed the tabulation process in record time, the results will be published on 16th April at the official website of the SSLC examination government of Kerala. Nearly 13,000 teachers were deployed for the SSLC centralised valuation camps. Students can also get the results via SMS too. Kerala SSLC results 2014 will be available on official websites. With the Kerala SSLC results to be announced on 16th April at 3 pm, it is would be better to know the websites which publish the Kerala SSLC results. This year 4, 64310 students had appeared for the exam. The results will be announced by the Education Minister Shri P K Abdu Rabb during an official press conference. Later the results will be published at the official website of the SSLC examination government of Kerala. Kerala higher secondary (HSE) or plus two results 2014 announcement (publishing) date is scheduled for 13th May. As students are looking for kerala plus two results 2014 publishing date, it is known that it would come out on 13th of the next month. The results will be declared by Education Minister P K Abdu Rubb at a press conference. 15000 teachers were deployed to evaluate the answer sheets. Students can check the official websites to know their results status. Do you know how to get Kerala SSLC exam 2014 results via SMS? You can get the Kerala state board SSLC exam results 2014 through sms on your mobile phone. This article will help you to get the registration code number that which can be used to know the results. If you are a student appeared for the Kerala SSLC exam 2014 and is waiting for the results, you can get the results through the m-Governance initiated by the Kerala State IT Mission under the Department of IT, Government of Kerala.